"A great tasting spicy sushi roll, for those who like extra pizzazz. You can use cooked or raw tuna to your preference to achieve great flavors. Great for a filling Japanese meal. Tastes great with a wasabi soy dip." To roll the sushi, cover a bamboo sushi rolling mat with plastic wrap. 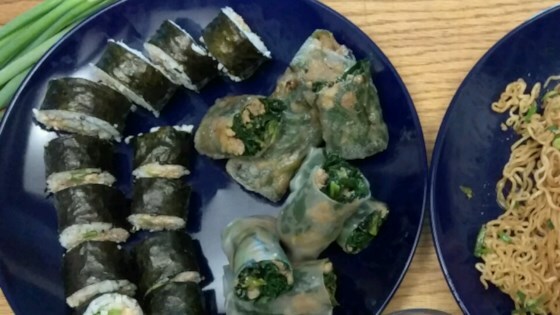 Lay a sheet of nori, rough side up, on the plastic wrap. With wet fingers, firmly pat a thick, even layer of prepared rice over the nori, covering it completely. Place about 1 tablespoon each of diced cucumber, carrot, and avocado in a line along the bottom edge of the sheet, and spread a line of tuna mixture alongside the vegetables. For another tuna twist try substituting the spicy tuna with shoyu tuna--take 1 can drained tuna and add 3 tbs sugar and 4 tbs soy sauce and heat until the tuna absorbs all of the liquid. I tried this today and it was delicious! Plus it's easy and cheap - hard to argue with that! I substituted green onion for avocado and it worked great. My 2-year-old even had some.